Technology has really made life much easier and faster. 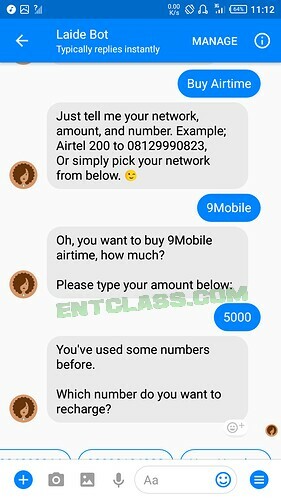 It will interest me to introduce a Messenger bot to you called Laide. This name might sound like a Yoruba name but it isn't what we thought. 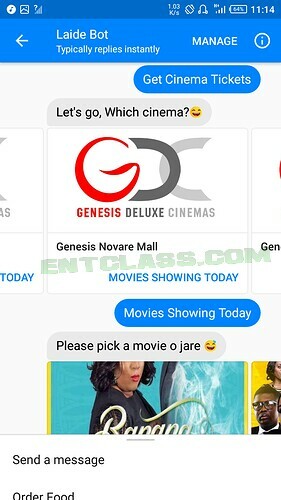 Laide is a new Facebook Messenger bot that serves as an assistant that can help you buy airtime, data, order food, and buy movie and event tickets. >> For movies, users can view descriptions and trailers before buying tickets. >> For food, review menus will be available before putting up an order. All payments are currently handled by a PCI DSS (payment card industry data security standard) certified platform called Paystack. 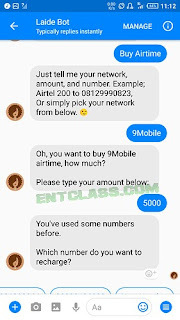 If you are buying airtime using Laide chat bot, you also get 5% cashback which you can use to pay for other Laide services. >> Keep tabs on the latest movies showing in Cinemas all over Nigeria, and buy tickets for them easily. >> Find out about upcoming Shows, or Events and buy tickets for them. >> Order Food! Yes! From our dear Ewa aganyin and infamous Jollof rice to spaghetti bolognese, from Chicken casseroles and other "medeh-medeh" to hot Afang soup. With top class restaurants, Laide's got you covered. What do you think about Laide Bot? This development is good, thanks for letting us know. It's true that this sort of stuff brings about an increase in the unemployment rate in the country but at the same time we have to embrace this emerging technology. This is nice, this is the beginning of great things.